There is a lot of interest in an article that just appeared in Biological Psychiatry about a new magnetic stimulation technique that may be associated with rapid antidepressant effects in both unipolar and bipolar depression. 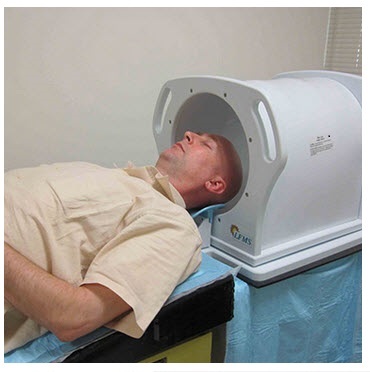 Researchers at McLean Hospital were studying Low Frequency Magnetic Stimulation as a way of imaging the brains of bipolar patients and discovered that many of them experienced a rapid improvement in mood. “LFMS is unlike any current treatment. It uses magnetic fields that are a fraction of the strength but at a higher frequency than the electromagnetic fields used in TMS [transcranial magnetic stimulation] and ECT [electroconvulsive therapy],” according to first author of the article Michael Rohan, a physicist at McLean Hospital’s Brain Imaging Center and a lecturer at Harvard Medical School. Using a portable tabletop LFMS device that Rohan designed, the researchers studied 63 volunteers between the ages of 18 and 65. All participants had been diagnosed with either major depressive disorder or bipolar disorder and had been on a regimen of antidepressants or mood-stabilizing medications for at least six weeks. As the authors note, this study was not designed to show that the device would cause long lasting antidepressant effects. The study was exploratory and designed to define the characteristics of the stimulation that would have immediate antidepressant effects. Although the mechanisms responsible for the mood-elevating effects of other electromagnetic therapies suchvas ECT (18,20), repetitive transcranial magnetic stimulation (42,43), and deep brain stimulation (44,45) (Table 3) are still unknown, the strength, location, and frequency of the pulsed fields that characterize LFMS suggest that its mechanism of action significantly differs from the direct actions of other treatments. These other modalities apply electric fields greater than 50 V/m to various regions of the brain, field strengths that can directly depolarize neurons (46). By contrast, LFMS-induced electric fields are of relatively low strength (#1 V/m) and are too low to induce depolarization. However, recent work has shown that rapidly fluctuating low strength magnetic fields that are below the threshold for depolarization can still influence neuronal activity.